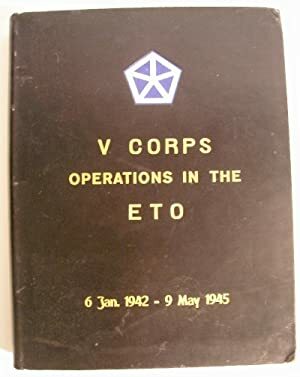 V Corps Operations in the ETO 6 January 1942 - 9 May 1945. Restricted. US Army, V Corps. (Lt. Col. Edgar Wilkerson et al). 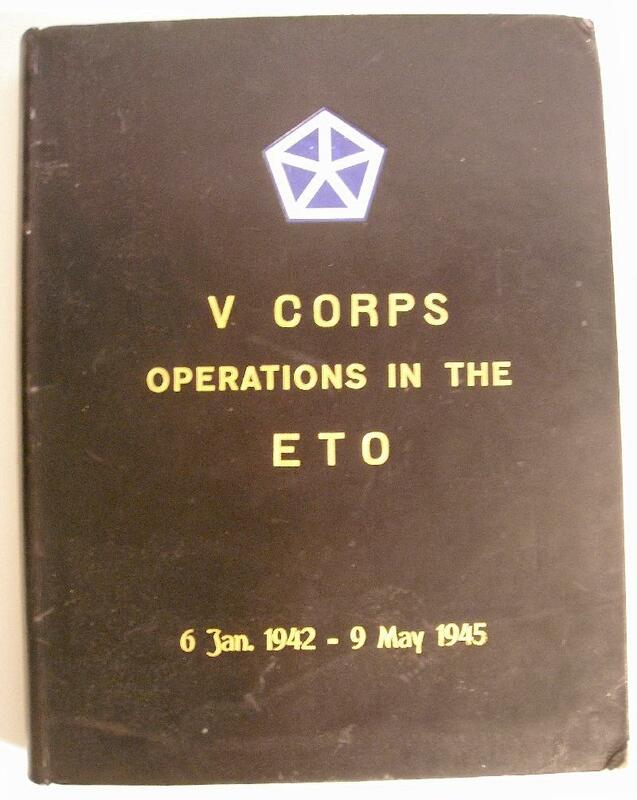 Publisher: 668th Engineer Topo Co., c. 1945. Open weekends in November & December. US ORDERS USUALLY SHIPPED THE SAME DAY THE ORDER IS RECEIVED. ------- SHIPPING TIMES: I looked at actual shipping (in transit) times for shipments this fall (2015): Media mail to the west coast is running 2 to 5 days. Most locations in the US the delivery is in 2 days. Priority to west coast is 2 to 3 days. 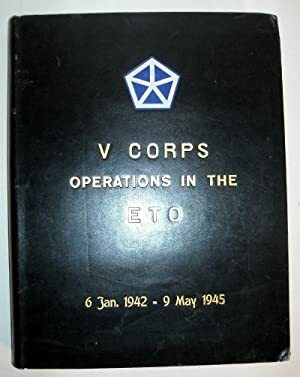 ------- RECENT STATIC PAGE CATALOGUES of military books are view-able at http://www.rwmilitarybooks.com back to List 54 or at my original site at http://home.earthlink.net/~militarybooks/ back to List 39. The most recent catalogue, as of October 2017, is List 89. BOOKS MIGRATE TO ABE ABOUT A MONTH OF TWO AFTER THEY ARE ON MY SITE AND ARE MARKED UP ON ABE. ------- SEND AN E MAIL TO SUBSCRIBE to e mail catalogue updates. ------- Specializing in military history of all periods and countries. Current inventory is about 36,000 volumes. Each catalogue contains between 800-1500 items. -------- Hours of operations: Monday to Saturday 8:30am - 8pm eastern. Open Sundays in November & December. Visitors may pick up orders by appointment only. Hardback books mailed in boxes. All books mailed with tracking numbers. Shipping times: From DC to west coast: Media mail averages 3-4 days and Priority 2-3 days from DC to CA. 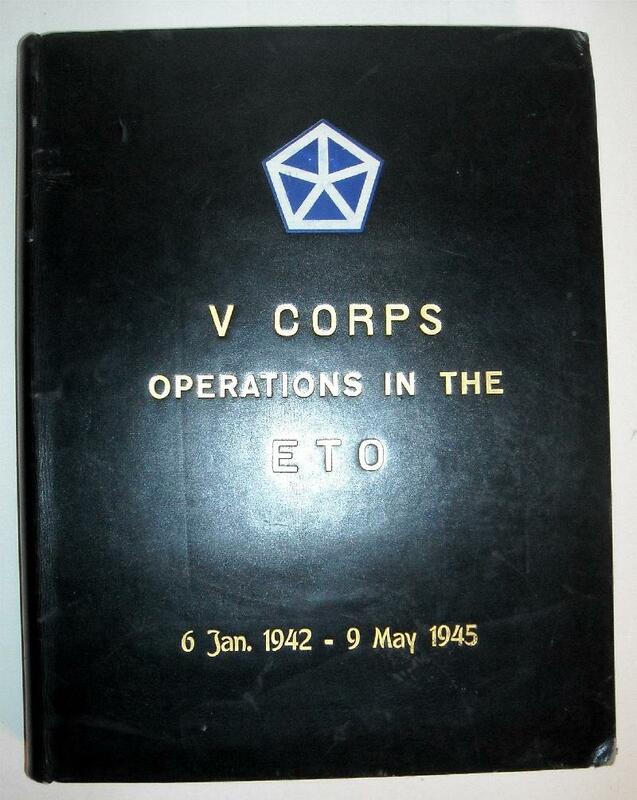 Selling Quality Military History for over 30 Years. Military Books' websites http://www.rwmilitarybooks.com and http://home.earthlink.net/~militarybooks/ Email to militarybooks@earthlink.net or by phone to 202-333-7308 or 202-248-7448. Inventory as of January 2018 about 36,000 entries but only 29,500 are posted on ABE. ORDERS USUALLY SHIPPED THE SAME DAY THE ORDER IS RECEIVED. Open weekends in November & December. ------- SHIPPING IS AT YOUR RISK UNLESS INSURED. Indicate if you desire insurance in "Special Instructions". It will be assumed that you do not desire this option unless you specifically request it.----- ----- EXPRESS MAIL shipping is available by special arrangement. ----Visitors by appointment only.-------- I Now accept PAYPAL for direct purchases only (not on ABE). MAKE CHECKS & MONEY ORDERS payable to Military Books. Send to 3226 Woodley Rd NW Washington DC 20008-3334. Reserved books held for 7 to 10 days to allow your check to arrive. $20.00 fee for bounced checks. ------ OPTIONAL INSURANCE: shipment at your risk unless insured (Postal loss rate is extremely low). In the US $2.00 for orders under $50.00, $3.00 for orders under $100.00 and $1.00 for each extra $100.00. ------ FOREIGN CUSTOMERS: Shipment at your risk if you do not request insurance. Checks also accepted if made on a US bank (must have an ABA code). Foreign Postal Service Money Orders & Travelers Checks also OK. Cash OK but not recommended. Shipping charges will be quoted when you inquire about availability. Please indicate First Class or Prioirty delivery and if you want insurance. All international service is by air: Postal service no longer offers surface delivery.------ BOOKS MAY BE PICKED UP BY APPOINTMENT ONLY. Thanks Richard Williams, proprietor.